Yndi Halda's Enjoy Eternal Bliss unfolds through four tracks that clock in at a little more than an hour. This is expansive, epic instrumental music with varied sections and movements that rise to crescendo out of subtle, gentle ambience. Melodies ebb and flow, rising to beautiful explosions. It's the kind of music which could soundtrack a modern day love story as easily as it could a mid-century war. A barrage of instrumentation is woven together to form the fabric of this effort, with soaring violins and whispering glockenspiels, melodies of clarinets and banjos, and driving guitars and bass supported by a military-styled percussion sound. 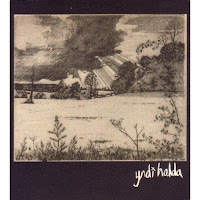 With one beautiful soundscape after another, Yndi Halda create something bigger than an emotional rollercoaster, it's more like a full-on mountain assault through thick blizzards and incredible sunshine.